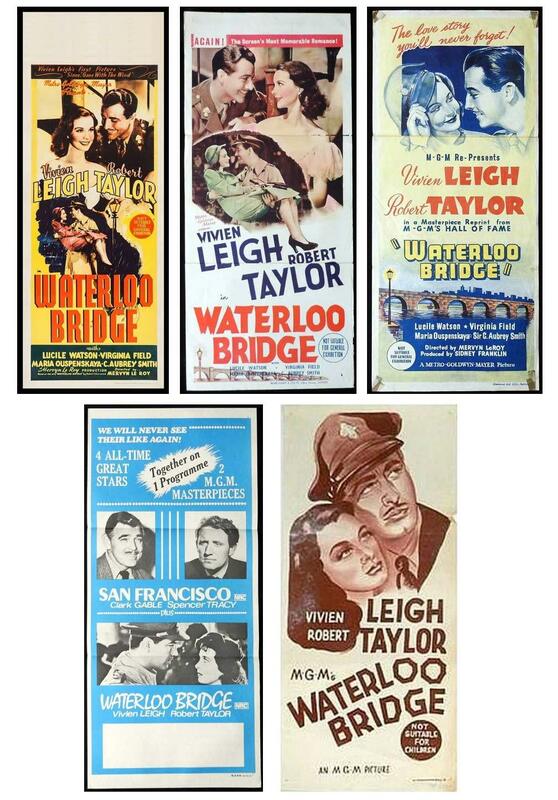 News | Moviemem Original Movie Posters - WATERLOO BRIDGE Daybill Movie Poster Original or Reissue? The year of release of daybills for Waterloo Bridge is fairly easy to spot when you see them side by side. However, the original true first release is so rare that it has only turned up a couple of times so that has created some confusion amongst collectors. The original is a long daybill measuring 15" x 40" and pictured top left. Second from left is an early 40s re release printed by Marchant and Co.with the notation "Again!". Third from the left is a later release probably from 1948 with the helpful notation "A Masterpiece Reprint from MGM's Hall of Fame'. Bottom left is the 1970s release for the double feature of San Francisco and Waterloo Bridge and bottom right is a 50s one colour re release daybill. The long daybill and the Marchant printed re release are the ones to have - both stunning Australian movie posters.